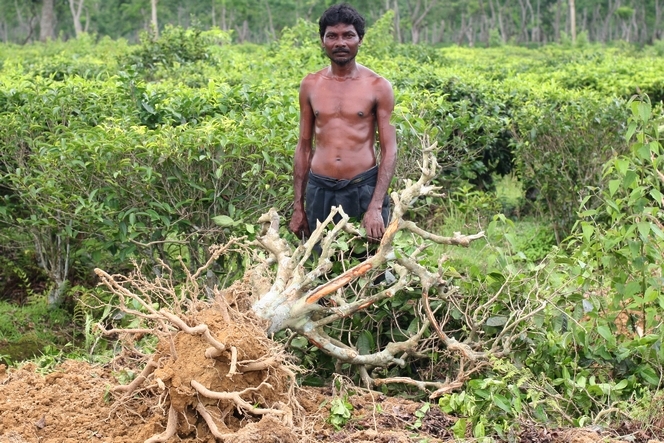 Pulling up a tea plant requires remarkable strength, as its roots plunge deep into the ground. But although the man in this picture is sweating heavily, it is not because he has achieved this feat. In fact, the bush has just been uprooted by a mechanical digger, and the man is simply hacking off the stump with a machete. He is sweating so much because Assam’s heat and the high humidity levels of this region are at their peak. What surprises me most here, around Jorhat, is the complete lack of wind. For months on end, not a leaf stirs in this area of India, enclosed between the high plateaux of Tibet to the north, and the mountains of Burma in the east.